As any iPhone fan would know, Apple’s latest move to drop the 3.5mm headphone jack from the iPhone 7 means that users now have to use a lightning adaptor for legacy headphones, which can be a little inconvenient for music lovers. Fortunately for iPhone 7 fans, here we review the top 10 best Bluetooth headphones for iPhone 7 that perform exceptionally well in terms of audio performance, sound quality and battery life, without the huge price tag. These Bluetooth headphones are perfect for workouts, gym and heavy exercises, making them the perfect companion on an outdoor run or for quiet listening in the library. You don’t need to have the 3.5mm auxiliary lightning adaptor to use these headphones as well – the versatile Bluetooth functionality also allows you to connect wirelessly to other mobile devices (such as your iPad) to stream quality audio music. At the time of writing, some of these best Bluetooth headphones for iPhone 7 are selling at great bargain prices so be sure to check them out below! The SoundPEATS are one of the best bluetooth headphones for iPhone 7 that you can ever find at low cost, with superb sound performance and portability. These noise cancelling headphones come with custom designed ear tips and two types of different ear hooks to ensure a comfortable and secure fit for everyone. These special ear hooks ensure that the ear buds do not fall off in a gym or workout. The battery life of the SoundPeats is very good, with up to 6 hours of music playtime, 145 hours of standby time and 1-2 hours of charging time. It has a super lightweight design and its net weight is only 3.17 ounces, which means you will feel nothing for gym and workouts. Furthermore, these amazing headphones are IPX4-rated sweat resistant and optimized for outdoor activities such as jogging, cycling, driving, camping and hiking. 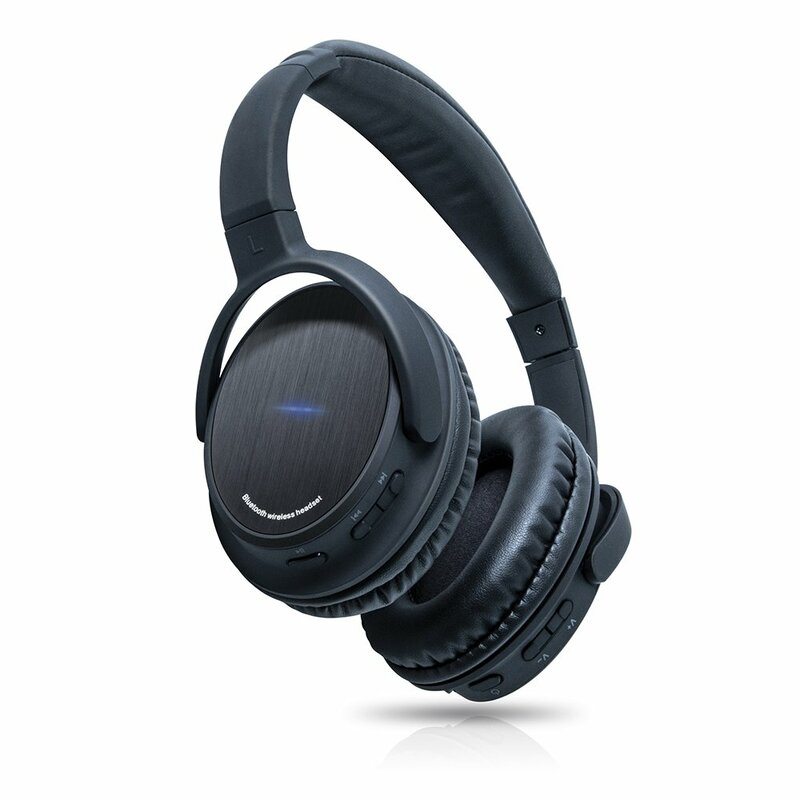 It also features the latest Bluetooth 4.1 technology and noise cancelling also provides high-definition sound and stable Bluetooth streaming. In sum, the SoundPEATs are some of the very best bluetooth headphones for iPhone 7 that you can buy without the heavy price tag. The sound performance of the SoundPEATS really impressed us. The clarity and depth in the bass is unrivalled by any headphone close to this price. The 60Hz range is beautiful and you can feel the depth and quality of the soundtracks with that amazing sub bass, or a band playing a thick, funky bass line. Apart from its surprisingly excellent bass, you can turn up these headphones very loud. If you love warm and bassy headphones with good clarity, the SoundPEATS are a set of formidable headphones that deliver quality sound. 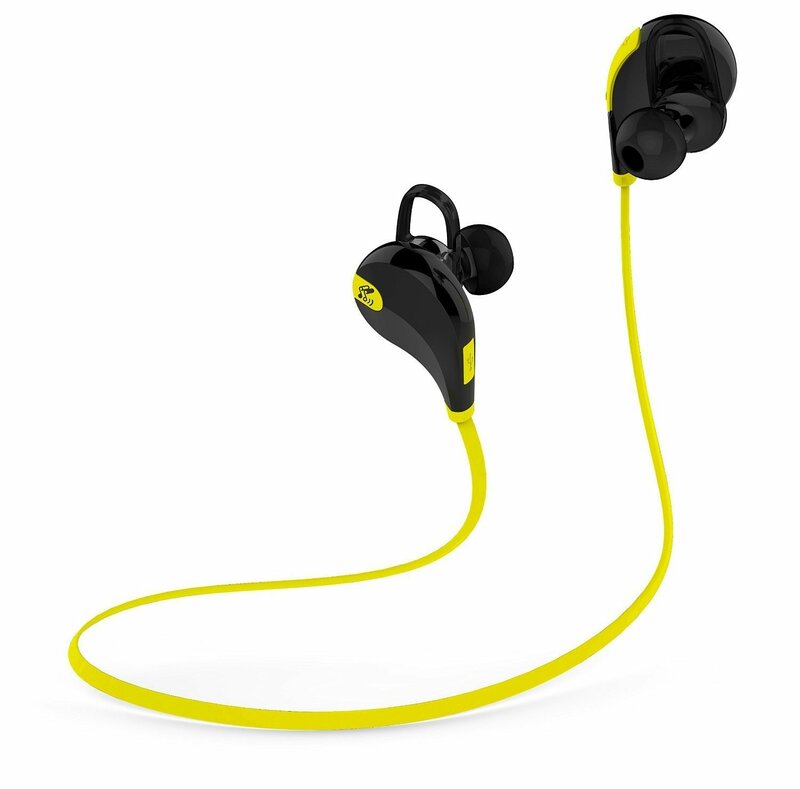 We really liked the design and comfort of the SoundPEATS. They fit surprisingly well in your ears without any effort, and they block outside sound very well. We also liked the behind-the-neck style of headphones; even if they fall out of your ears while exercising they will not hit the ground. The Bluetooth also pairs fast with great connection between 10 to 100 yards depending on where your iPhone is placed. 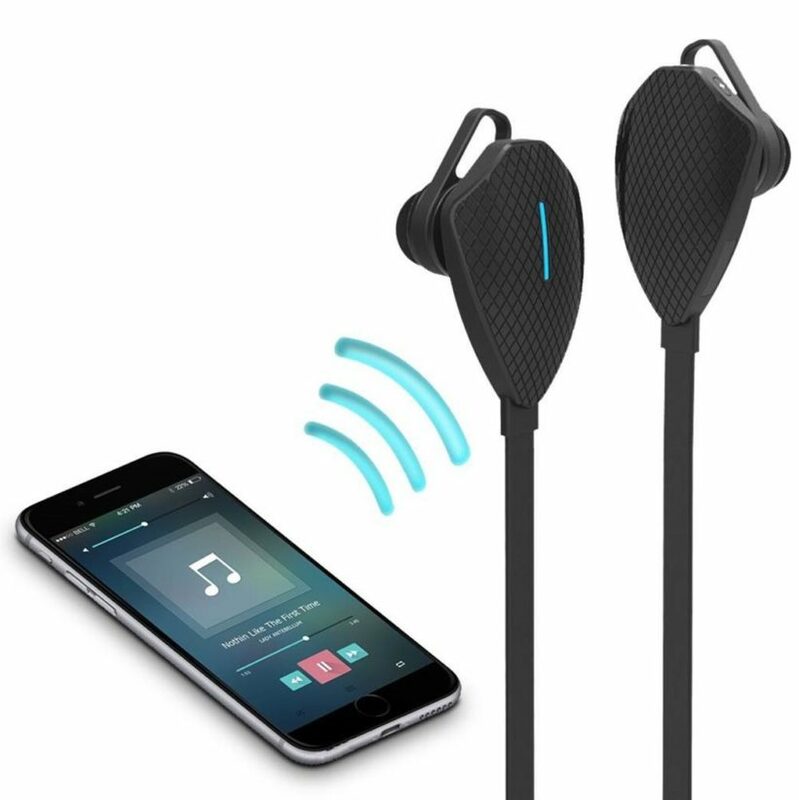 The Bluetooth supports two connected devices simultaneously and allows them to automatically connect after pairing successfully for the first time. The volume controls are simple and intuitive to use – they also work like normal track skipping functions by holding them down for about 3-4 seconds. There is one power button for on/off, pairing, play and pause. The entire package itself comes with a micro-USB charging cable which is stunningly short (about 6-7 inches). 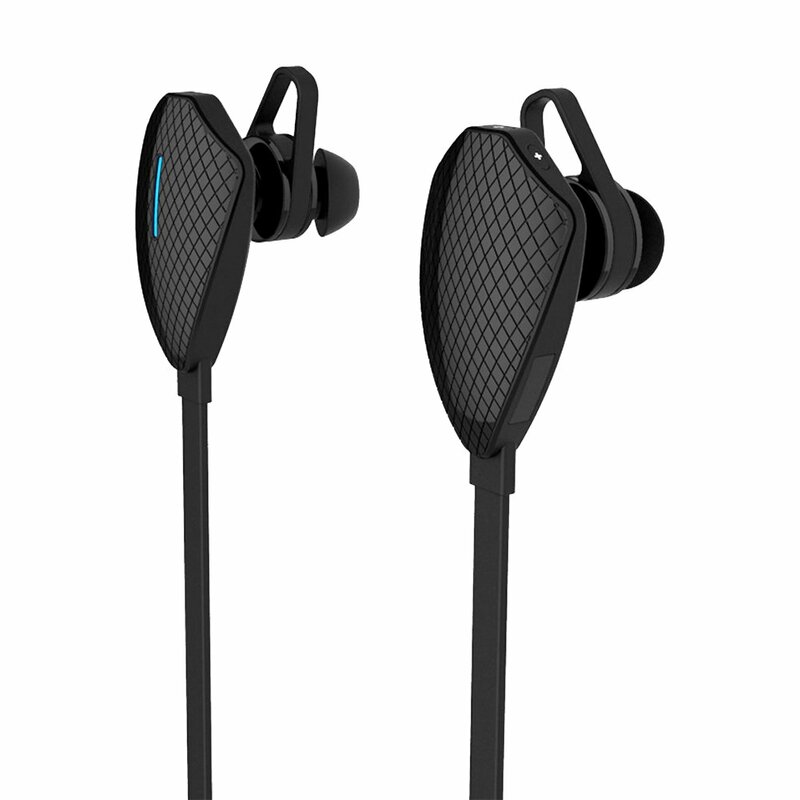 It also comes with a range of earbuds of various sizes so that you can customize it to your liking and ear fit. We really liked the overall feel and design of the SoundPEATS and you can feel that the manufacturers put in a lot of effort to make these headphones very versatile and portable. The Verdict? If you are looking for some of the best bluetooth headphones for iPhone 7, the SoundPEATS will truly impress you with its quality audio performance, durable design, battery life and portability. It’s a neat solution if you need to go to the gym and want to listen to your favorite music connected to your iPhone 7. It’s also pretty easy to charge these headphones and the battery will deliver a solid 6 hours of music performance. We also liked its sleek, unique over-the-neck design for extra stability. At this low-cost price range, the SoundPEATS are simply unbeatable and we highly recommend them. The TaoTronics Bluetooth Headphones are hands down one of the best Bluetooth headphones for iPhone 7 and a very good set of running / workout headphones in general. It features two powerful audio drivers on each side to deliver balanced audio and crystal clear sound. The comfortable and secure design fits perfectly into your ear – the design of the cable is such that it stays out of the way when running, jogging or exercising. It even features CVC Noise Cancellation 6.0 technology which reduces outside noises, enables clearer sound from the microphone, allowing you to get high quality, hands-free phone conversations while outdoors in working in the gym. These headphones can deliver up to 5 hours of continuous music playtime, and the latest Bluetooth 4.1 with aptX codec provides pure, high quality sound. At the time of writing, the TaoTronics come highly recommended. The sound quality of the TaoTronics is superb, with noise cancellation a plus and the bass on the positive side. You can really get great bass and full stereo sound out of these Bluetooth headphones. The highs and mids are crisp and clear, and sound pretty amazing from headphones at this price range. They can also get very loud without any distortion – the sound can go very loud and clear and it also gives you an audible beep when you reach the volume limit, which is definitely a nice added touch. The TaoTronics headphones are very comfortable to wear and stable in the ears. These headphones are very versatile and you can use them about anywhere – the gym, outside, lounging in the house, etc. We also liked the fact that it has a built in mic so you can operate voice commands or take phone calls on the go with your iPhone 7. The range of these headphones is great – you can easily roam around the gym or run on the treadmill without having to worry about the sound cutting out. We also liked the 5 hour battery life of these headphones – you can take it with you for multiple workouts on a single charge, or use them on the go. The design of the TaoTronics is minimalist and simple. The buttons are great and all on the right earbud. The big center button pauses the sound with a single push. The volume buttons are intuitive and easy to use while running. If you need to skip a song, you can use the volume buttons and just hold it down for a second. The package also comes with 2 sets of interchangeable earbuds, 5 different sized ear hooks for stability and a micro USB charge cable. The Verdict? We were very satisfied with the performance of the TaoTronics – it is really an all-rounded headphone and simply one of the very best Bluetooth headphones for iPhone 7 use or mobile use in general. We liked the fact that you can take these headphones virtually anywhere and it will function perfectly, and produce superb audio performance with crisp highs and mids. The battery life of these Bluetooth headphones was also outstanding and long-lasting on a single charge – we have tried these headphones a few times on the initial charge and they still keep playing. At this low cost price range, the TaoTronics are simply among the very best bluetooth headphones for iPhone 7 that you can find for the portability and versatility. If you are looking for an over-the-ear option, the Skullcandy Hesh 2 is simply one of the best bluetooth headphones for iPhone 7 at a very reasonable price. The Hesh 2 is specifically designed for an elevated audio experience in a sleek and simplified aesthetic, with powerful 50mm drivers for refreshingly loud and clear playback. It also features a long lasting battery life of 12 hours after a single charge, with backup cable and remote functionality. In addition, the Hesh 2 comes with its noise isolating fit and leather seals around the ears, as well as on-board mic pulse remote for taking calls and switching up playlists. It’s one of the best Bluetooth headphones for iPhone 7 that comes without the hefty price tag and delivers stunning audio performance. The first thing we liked about the Hesh 2 is how comfortable they are. The packaging describes these headphones as having “ear pillows” – and we have found these headphones very comfortable indeed. The cans are fitted with circular pads that cover over the ears well, so you can listen to these headphones for hours on without feeling fatigued. The Hesh 2 are also very durable and sturdy, with enough adjustable points for you to feel comfortable. They are well constructed with a great rubbery and plastic feel which is good. In terms of sound performance, we felt that the Hesh 2 are a great substitute if you don’t want to spend money on Beats or the Parrot Ziks. These headphones give a nice clean sound with crisp highs anad mids. They are not bass heavy but deliver good tight bass; the sound does not feel muddled or bleed into the mids. The passive noise cancelling also helps to keep some sound out, although not entirely. These headphones are great for listening to music, podcasts, audiobooks, or just watching video on your iPhone 7 or any Bluetooth device for that matter. Connecting to these headphones via the iPhone 7 is simply like connecting to a standard Bluetooth device. The connectivity is very good and we did not see any issues with the headphones staying connected. The Bluetooth range is also good – we were able to walk around 27 feet away from the iPhone before the music began to cut out. The headphone controls are also conveniently located on the right ear cup and are usable and function reliably. It also has a nice charging port on the top of the left ear cup. 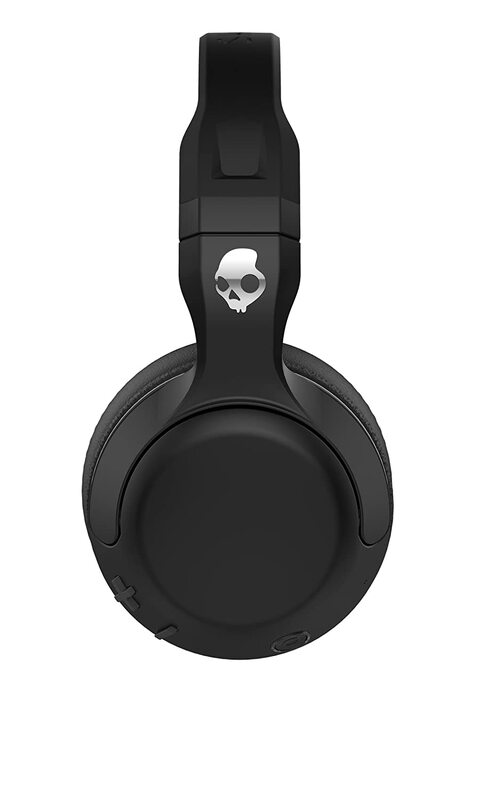 The overall design of the Skullcandy felt very modern and aesthetically pleasing. The Verdict? The Skullcandy Hesh 2 is a set of extremely comfortable headphones with soft, padded cans and good sound performance. We particularly liked the long lasting battery life of 12 hours which is pretty good considering the price of these headphones. The Hesh 2 are undoubtedly one of the best bluetooth headphones for iPhone 7 and if you are looking for an over-the-ear option to go with your iPhone, we highly recommend these. 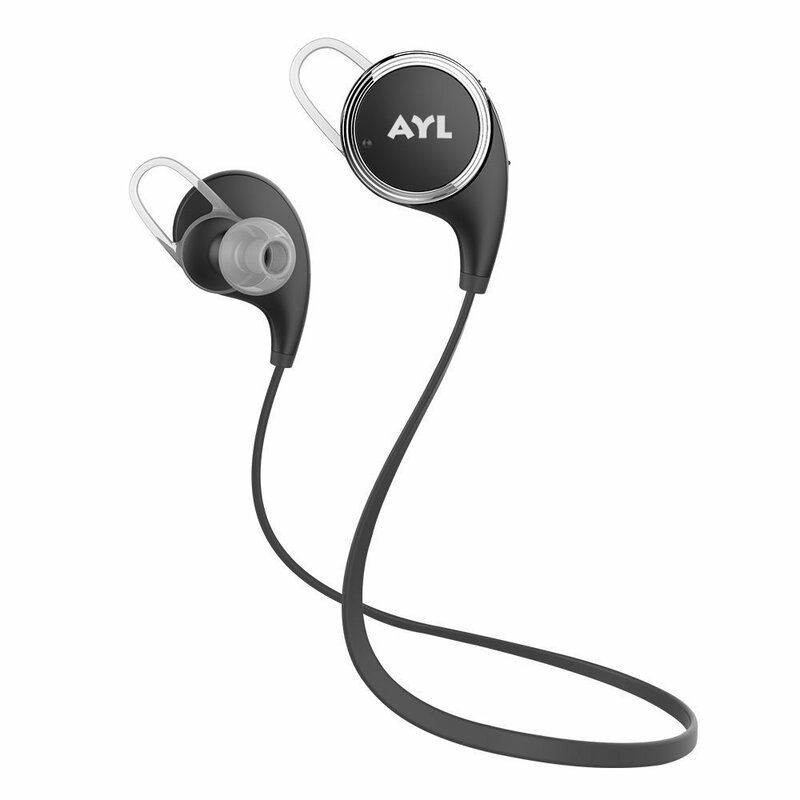 The AYL QY8 Bluetooth sport headphones are some of the sleekest and most versatile headphones you can get on a budget. These Bluetooth headphones feature the latest Bluetooth 4.1 technology and aptx for quality audio streaming and very good sound performance. You can even pair the AYLs with any 2 Bluetooth devices at a time. It’s essentially built for longer listening and extended battery life, while allowing you the convenience of running and doing workouts to the beat of the music. Apart from that, these headphones are super comfortable to wear and very easy to use. They are one of the best Bluetooth headphones for iPhone 7 – if you prefer a cheaper alternative without compromising on sound quality and comfort. We found that the AYLs are super comfortable – they fit snug into your ears and do not even hint at the possibility of accidently falling out. It provides a great overall seal, with better noise isolation and comfort for workouts or on the go. The Bluetooth 4.1 technology allows for greater range, higher quality sound, faster connection, and instant response times compared to the Bluetooth 4.0 technology. The sound performance of the AYLs on the iPhone 7 exceeded all our expectations. These headphones cost just a fraction of their more expensive counterparts, but yet sound nearly as good. The QY8s have excellent bass, mids and crisp highs. The music feels fully bodied and the headphones have very good sound range. In fact, we found that these headphones provide one of the best bass we have ever heard from a Bluetooth headphone set. The sound does improve after 40 hours of use and will not distort at high volumes. The AYLs are one of the easiest headphones to use. They pair very quickly with the iPhone 7 as you would a normal Bluetooth device. You can even see how much battery capacity is remaining on your headphones on your iPhone. Also, once you have paired the headphones to a device, the next time you turn on the headphones they will connect automatically. The entire package contains a set of AYL Bluetooth headphones, MicroUSB cable for charging, four sets of silicon earbuds of different sizes, storage pouch and user manual. To get the best user experience out of the AYLs, we recommend getting a proper seal within your ear with the right earbuds. You need to have the tightest fit possible without causing discomfort to also have the best bass response. Once you get these settled, you will truly love the AYL headphones. The Verdict? If you are looking for a low-cost substitute for the AirPods on the iPhone 7, the AYL QY8s are undoubtedly one of the very best bluetooth headphones for iPhone 7 that will definitely impress you. We were quite sceptical about these headphones as it came at such a low price point, but we were literally blown away but its sound performance. Considering their low price point, overall sound quality and quality construction, we highly recommend these for your iPhone. 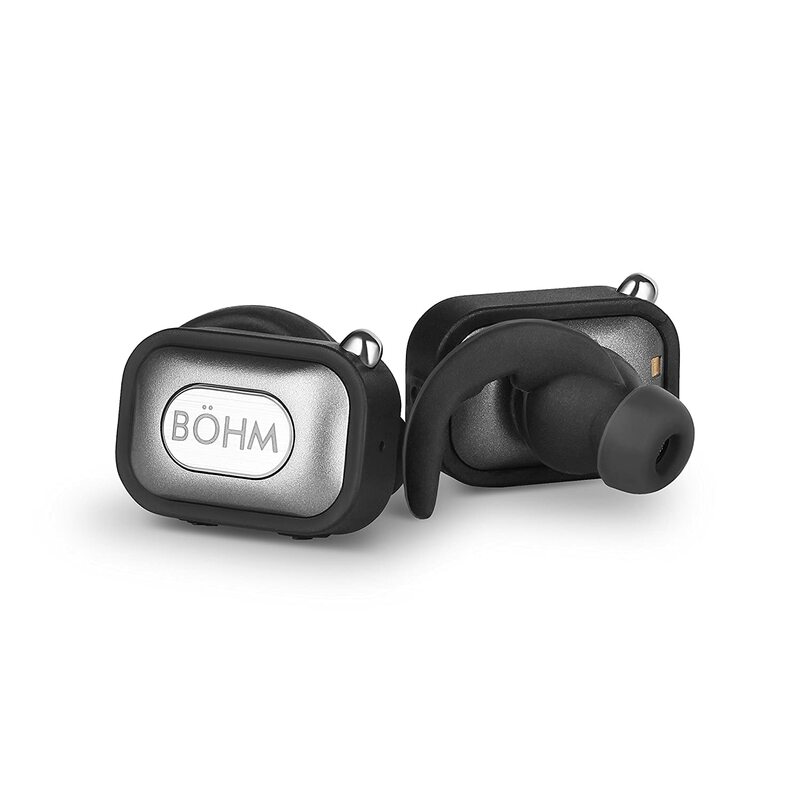 If you are looking for a set of super sleek cordless Bluetooth headphones that can connect to your iPhone 7, the BOHM S10 might just be your answer. The S10s are sport earbuds with a microphone and comes with a charging station. They can wirelessly stream crisp, clear HD sound and bass from your iPhone 7, and comes with incredible battery life on a single charge. These headphones are designed for sports and outdoor activities on the go – the comfy earhooks and flush ear-in design provide safety and stability for rigorous activity. The sound performances of the S10s are also quite good considering their size – we were quite impressed with the audio and bass response of these headphones. They are one of the best Bluetooth headphones for iPhone 7 that are cordless and come with the added versatility and portability for gym and outdoor usage. The first thing we noticed about the S10s were just how light they were. You can wear them in your ears and you probably won’t even remember you are wearing them during a workout. The battery life was also surprisingly good – you can get a decent 4-5 hours of playtime from a single charge. You can also check the battery life according to the meter on your iPhone. To charge these headphones, all you need to do is sit both of them inside the charging case and connect them to the Micro-USB cable. There is also a red light indicator to let you know when these headphones are done charging. The sound performance of the S10s was pretty good considering how small these headphones were. We managed to hear crystal clear highs and mids from these headphones, with a good deal of bass. The treble on these headphones are also bright and clear, and we didn’t have any static issues while pairing with the iPhone 7. That said, it is important to get the right fit for these headphones – make sure to get the right earbud size to ensure that you have the best bass response and sound performance. Once this is achieved, you will thoroughly enjoy the crystal clear mids and vocals on your workouts or runs. The S10s are very easy to use and connect to your iPhone 7. Simply press and hold the MFB button and after a few seconds you will hear a ‘power on’ message from each earbud. As you continue pressing the MFB button you will then hear a left channel and right channel prompt from each earbud, which means that the earbuds are now connected to each other and are ready to link a device. You can go to your Bluetooth settings on your iPhone 7 and connect to the S10 earbuds. The Verdict? 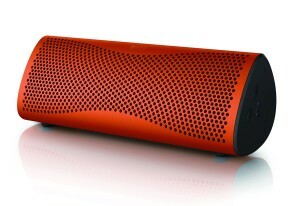 We really liked the sleek, super portable design of the BOHM S10. These are undoubtedly one of the best Bluetooth headphones for iPhone 7 if you are looking for a cordless option and want to use these for workouts or outdoor sports. These headphones are entirely wireless and produce decent sound performance with good overall bass response. The battery life also lasts a good 4-5 hours (depending on the volume), and we really enjoyed taking them to the beach for a causal jog or run. You can even take calls with its built-in microphone, making the S10s one of the most versatile and best Bluetooth headphones for the iPhone 7. The Photive BTH3 are another set of excellent over-ear Bluetooth headphones and another very good choice for pairing with the iPhone 7. These advanced headphones feature Bluetooth 4.0 and advanced CSR technology for quality audio streaming, without any tangled cords. The PH-BT3s also charges very quickly with its lithium-ion battery and gives up to 12 hours of battery life. Furthermore, it also comes with compact form factor and stylish design, making them very comfortable to wear and easy to bring around. At the time of writing, the Photive BTH3s are selling at a very good price point, and are well and truly one of the best Bluetooth headphones for iPhone 7 in the market. The first thing we noticed about the BTH3s were the sound quality. When we added an EQ to OSX and combined it with Spotify, we were quite blown away but the sound. These Bluetooth replayed our favorite soundtracks with excellent sound output in clarity and tight bass; we really liked the treble of these headphones which do not bleed into the mids. The sound also does not distort at high volumes. Considering that these are wireless headphones, we are quite confident that nothing else at this price point comes remotely close to the sound performance of the BTH3s when paired with the iPhone 7. We also enjoyed the comfort of these headphones. The headphones are very comfortable and are adjustable in size to fit your head. The ear cups are also large enough to fit over your ears and they are well placed; this is particularly useful if you have a larger head because the headphones can fit over your ears comfortably with the padded ear cups. They weigh in at 7 3/8 ounces. The padded ear cups also block some outside noise from getting into your ears and they act as a passive noise filter. The headphones are very comfortable and they are adjustable in size to fit your head. The ear cups are large enough to fit over my ears and they are well padded. I have a big head and the headphones were very comfortable with the padded ear cups and the padded head band. They weigh in at 7 3/8 ounces. The padded ear cups also block some outside noise from getting into your ears and they act as a passive noise filter. The headphones also have a built-in microphone that allows you to make and receive phone calls and they worked very well. We found that the Bluetooth pairing process was fast and easy with the iPhone 7, or any other mobile device. The headphones also come with an auxiliary cable that is 60 inches long and it is a flat cable that is designed not to get tangled. If you run out of battery, you can even plug this cable into the headphones and listen to music with the headphones turned off. This is a nice added touch if you are travelling and the battery gets low. They also come with a 32 inch USB charging cable that you can use with your computer’s USB port or wall charger. The Verdict? We highly recommend the PH-BT3 headphones if you are planning to get a decent set of headphones with your iPhone 7. Apart from its incredible battery life of 12 hours, you get very sound performance, decent bass response and very crisp trebles with your music. It also features a pretty impressive build quality – it’s all constructed out of a very nice rubbery matte black plastic that feels high quality. The Bluetooth 4.0 also allows for quality audio streaming and helps conserve headphone battery. At this price point, the PH-BT3s are definitely one of the best Bluetooth headphones for iPhone 7 that you can find and we highly recommend them. The BOHM B76 noise cancelling headphones are a set of very good Bluetooth headphones that will suit music lovers that wish to use the iPhone 7. They are slightly higher end headphones that produce powerful, rich, textured sound and extra bass. It also comes with advanced Bluetooth 4.0 and you can connect it to your iphone from up to 10 meters distance. These headphones are one of the most comfortable headphones on this list – they have cushioned foam ear pads that provide comfortable, relaxed listening. It also has a built-in volume control for hands-free convenience, and even comes with effective noise cancelling for up to 8 hours. The battery life pumps out a phenomenal 16 hours of continuous playtime – and are truly one of the best bluetooth headphones for iPhone 7 that you can find on the higher end. Our first impressions were that the BOHM B76s felt like really good quality headphones – they don’t feel cheap at all. Not only do they look great, these headphones sound pretty good and the noise cancelling is not bad too. The sound quality of these headphones are very good without a portable headphone amp, and sound even better with the noise cancellation turned on. The mids and bass are strong and punchy, which makes them perfect for those who like to listen to bassy music. These headphones also feature a warmer sound signature as compared to Bose or Beats. We really liked wearing this headphones to the gym or taking out on a run. The noise cancelling of the BOHM headphones are good but not exceptional. They do block out a decent amount of noise in our tests, and they will be impressive to many people who are not accustomed to using noise cancellation. You can also the noise cancelling without music, so if you need to quiet down the background noise these headphones will do the job pretty well. The comfortable seal around the earpads also helps with the natural noise isolation. 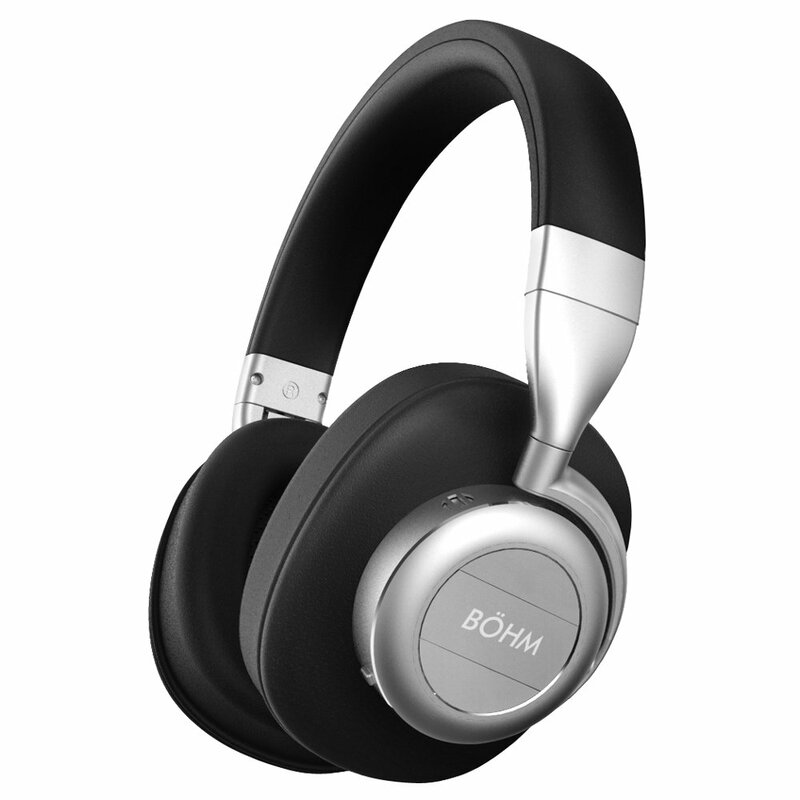 The controls on these BOHM headphones are easy to use with the on /off/ pause button, and also volume up and down buttons. The noise cancelling button also comes with an LED to tell you whether it’s on or off. Connect these headphones to your iPhone 7 is a snap – simply turn on the Bluetooth and connect it to your iPhone without any hassle. The Bluetooth range is decent – you can pair to these headphones with your iPhone 7 in your pocket and there will not be any static or drop off. The Verdict? The BOHM B76 headphones are highly value for money and simply one of the best Bluetooth headphones for iPhone 7. Apart from the good value, you are getting headphones that sound pretty good, have active noise cancelling and have pretty stylish and sleek build quality. The over ear headphone design also makes wearing these very comfortable. To top it off, these headphones also come with a foldable design for portability, 16 hours of incredible battery life and different colors to choose from. If you are looking for a wireless over ear listening option for your iPhone 7, the B76s are an excellent choice. If you are looking for a bass-heavy set of headphones to go with your iPhone 7, the Sony MDRX 950BTs may be the right choice for you. These headphones come with Bluetooth audio streaming with AAC and apt-X support and electronic bass boost circuity for added bass emphasis. Apart from the built-in microphone for hands free phone calling, it also has 40mm drivers for wide frequency response. 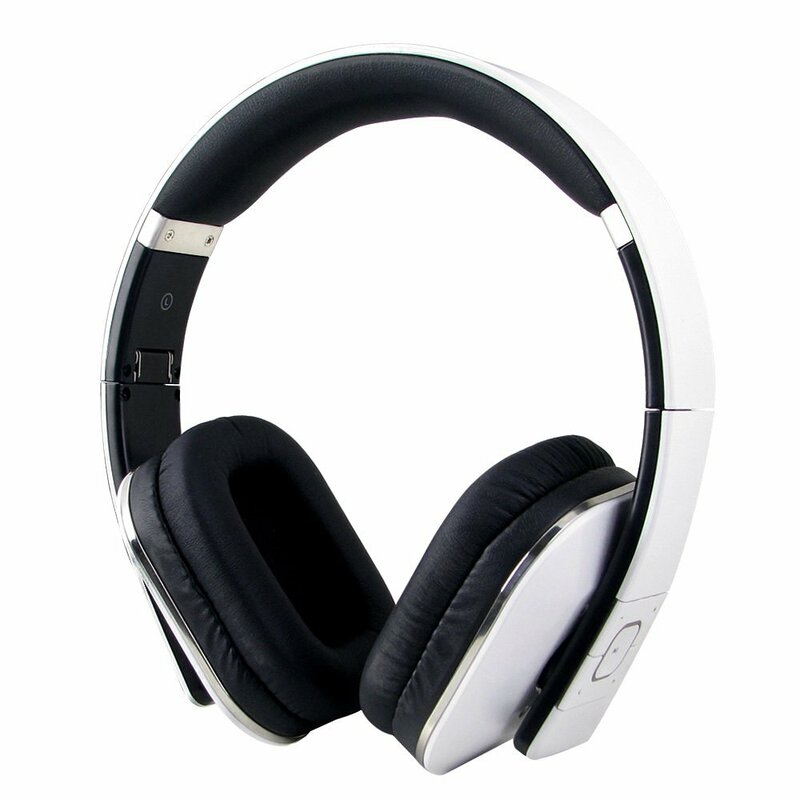 Furthermore, it comes with a comfortable around-the-ear design with sophisticated swivel design for portability. The 950BTs also have a rechargeable battery for up to 20 hours of music and passive mode for normal, corded operation without battery. At the time of writing, the 750BT are some of the best Bluetooth headphones for iPhone 7 for bass lovers. The first thing we liked about the Sony 950 BTs were its solid build quality. These headphones are solidly constructed and very light considering how big they are. The over-ear design and thick plush ear pads makes these headphones very comfortable to wear. The ear pads have pretty deep holes, compared to most other headphones, which means that your ears probably won’t touch the inside of the ear cub. We particularly liked the over-ear design which rested around the ears instead of on-ear, and these do a tremendous job in making you feel comfortable. The sound quality of these headphones is amazing. The 950BTs certainly rock the bass, which is great for hip-hop, rap, electronic dance music and lot of modern pop music. We also found that the extra bass does not take away from the mids and highs, which are pretty crisp. This makes the bass boost mostly unnecessary; the feature does not negatively affect audio quality but can distort music because it becomes slightly excessive. When we tested these headphones with vocal music, we could hear the voices come through loud and clear. We really liked the overall sound performance of the 950BTs and we would describe them as coming towards a colored and fun sound signature. These headphones have a closed design with noise isolation. The ear pads are thick and because of the good seal it will naturally block out ambient noise to help you immerse in the music. We felt that the noise cancelling technology was extremely good – these cancel noise better than most headphones that we tested. When you put them on you cannot hear the engines of the airplane or roadside traffic. It’s far better at cancelling noise than most other headphones at this price range. In terms of portability, we felt that these headphones can be bulky and do not fold. That said, the ear cups do rotate to make the headphones flat and you can easily carry these around inside a headphone case. The volume, track and call answer controls are great – we really liked how well they were placed and easily within reach. The Verdict? 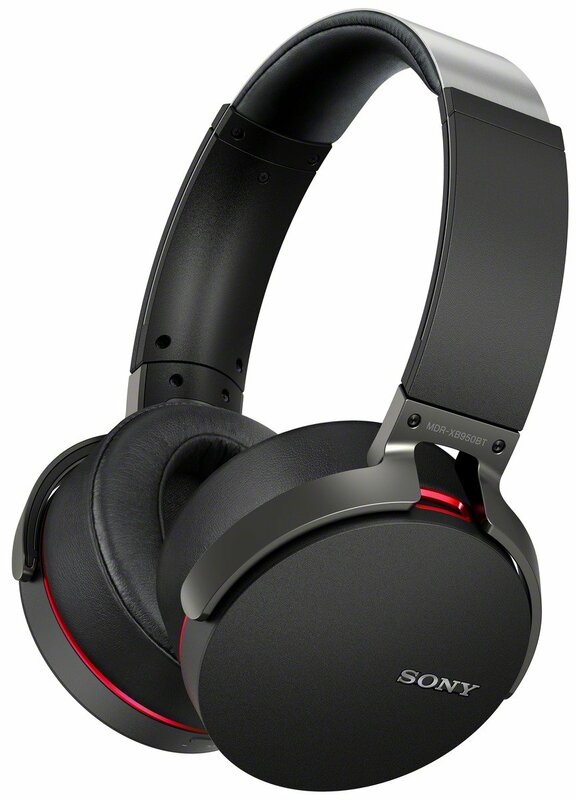 We really enjoyed listening to the Sony 950BTs and we would say that these headphones have by far some of the best audio performance and noise cancelling technology than any other headphone on this list. The battery life lasts for a whopping 20 hours of playtime, and combine this with the noise cancelling technology, creates one of the best Bluetooth headphones for iPhone 7 that you can ever get. That said, these headphones may come across as slightly bulky, and you may need a headphone case to transport them around. If you don’t mind the size and are just looking for high-end listening to go with your iPhone 7, we are convinced you will love these. The Apie Bluetooth Headphones are some of the best sports headphones you can find at a very reasonable price. These wireless headphones can pair with your iPhone 7 up to 10 meters away, and the Bluetooth headphones have mic functionality so you can answer calls on the spot. The running headphones are even sweatproof, so you won’t have to worry about wearing them when you’re doing a strenuous workout. These headphones are one of the most comfortable to wear – their ergonomic in-ear design with medical grade silicon ear gels and stabilizers provide you with a high quality listening experience. It also comes with a powerful rechargeable battery that provides up to 320 hours of stand-by time, 7 hours of talk time and 5 hours of continuous music playback. If you are looking for one of the best Bluetooth headphones for iPhone 7, we highly recommend these. The sound quality of the Apie headphones is solid for the price. The sound performance overall was pretty good, with good bass response and the treble was not harsh. We felt that the midrange could be a touch fuller/richer but this was not a deal-breaker. These headphones provide good isolation from background noise. The volume goes way louder than most headphones of this size and price range. Furthermore, this headphone has a built-in microphone which works well to take calls when listening to music or doing a workout. We really liked the sleek design of these headphones – they really get the job done for looking like a swanky pair of budget friendly headphones. These headphones also come with a set of different adjusters for the fit. The earpieces does a good job of staying within the ears despite a frantic level of physical activity – running, biking, gyming – these headphones will stay fit inside your ears. Furthermore, these headphones are very comfortable; they come with a little hook attached to the actual ear tip which allows them to stay inside your ears without falling out. 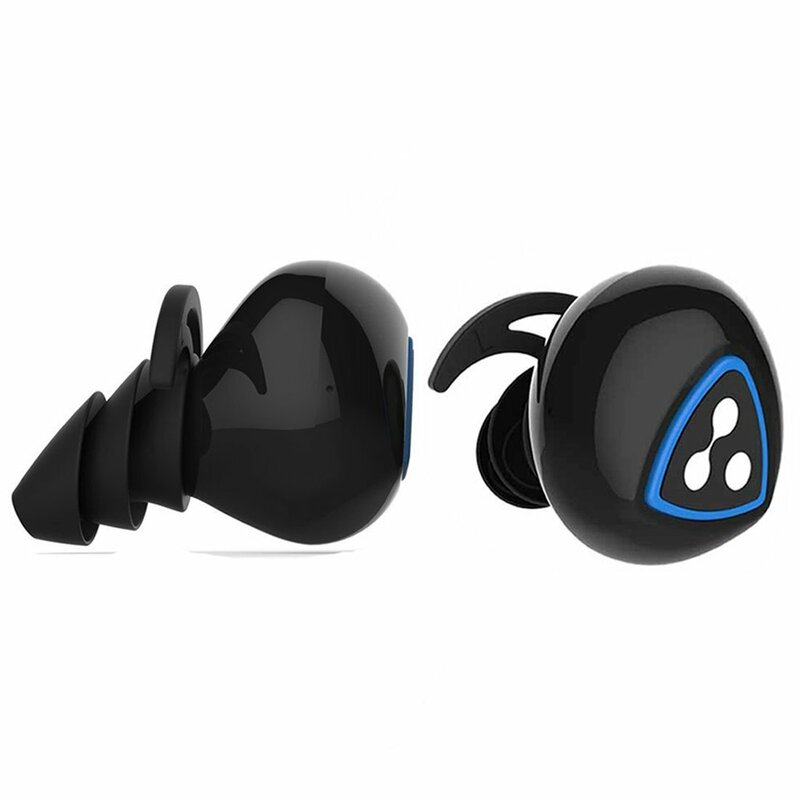 The entire package comes with a total of 3 different sized silicone ear pieces to provide the best fit. The Bluetooth pairing with the iPhone 7 was relatively straightforward and connects like a normal Bluetooth device. It also has a remote control built into the chord which we liked because it makes it so much easier to change the volume and songs. It also comes with instructions which are simple and easy to understand, and we had these headphones connected to the iPhone 7 in seconds. The Verdict? The Apie headphones are some of the best Bluetooth headphones for iPhone 7 you can find at a budget price that delivers all round sound performance. In our view, Apie has covered all areas from sound, battery life, controls, Bluetooth quality, to a unique and sleek looking style, to the fitting and comfort while wearing. They also come in a high quality package that includes multiple size earbuds for you to get the best fit. The battery life of these headphones is pretty decent too, and will last you several gym workouts on a single charge (between 4 to 5 hours). At the time of writing, the Apie headphones are selling at a bargain price so be sure to check them out! The August EP650 headphones are among the very best Bluetooth headphones you can find, and comes with the latest technology and NFC streaming for your iPhone 7. It is equipped with Bluetooth 4.1, NFC and aptX technology for high quality streaming. It also has a built-in microphone for you to take hands free calling. It’s internal lithium ion battery gives over 10 hours of battery life which is pretty good considering the budget price of these headphones. We found that the Bluetooth range is a good 10 meters or 30 feet which is good. The August EP650 is one of the best Bluetooth headphones for iPhone 7 that you can find, and have considerably exceeded our expectations in terms of sound performance. The sound quality of these headphones is incredible considering their budget price. When paired with the iPhone 7, we found that the sound brings extra bass to music and movies. These headphones pump out quite a lot of bass which sounds tight and punchy. The genres of music that sound amazing on these headphones are rap, hip-hop, dance, techno, electronic dance music, and so on. We really enjoyed the crisp and clear music and treble was not overly emphasized. We also found that the volume of these headphones can get really loud – much louder than normal usage without any distortion at high volumes. The frequency response range is a good 60 Hz to 20 KHz. We also particularly liked the comfort of these headphones. One of the best features of these headphones is how comfortable they are with their soft earpads. The cushions are rectangular and will cover your entire ear. The padding is also super comfortable and you can wear these for an extended period of time without having any ear fatigue. The entire package comes with a micro USB charge cord, 3.5mm adaptor (which you probably don’t need for your iPhone) and built-in battery. These headphones really do a good job of blocking out surrounding noise, especially the louder you have your music. We felt that these headphones would work very well on an airplane, or for use around an office. You can also do gym work while using these headphones; however they are not as light on the head because they are not dedicated sport Bluetooth headphones. That said, they bring so much energy and life to your soundtracks that we really liked listening to them while doing workouts. The Verdict? The August EP650 headphones are an absolutely stunning pair of headphones for your iPhone 7. They are sleek, light on the head, and have amazing music quality and feel extremely comfortable. You can literally feel the sound quality and material construction of these headphones while using them. They are also very comfortable to use and have quality padding on the headband and around the ears. At the time of writing, these headphones are selling at a good bargain price and are undoubtedly one of the best Bluetooth headphones for iPhone 7 you can find. The Syllable D900S are some of the best Bluetooth headphones for iPhone 7 that look super sleek and sound pretty good. They are completely wireless and you can choose to connect to a single piece or the pair together for your music. 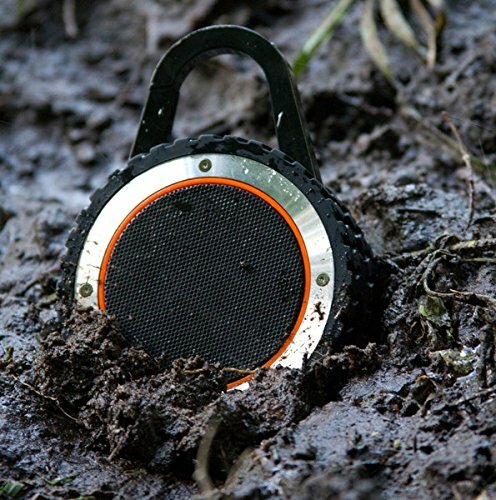 It features a built-in CSR 8670 Bluetooth chip and two power audio drivers to produce decent bass and stereo sound, with a connection range of up to 35 feet. 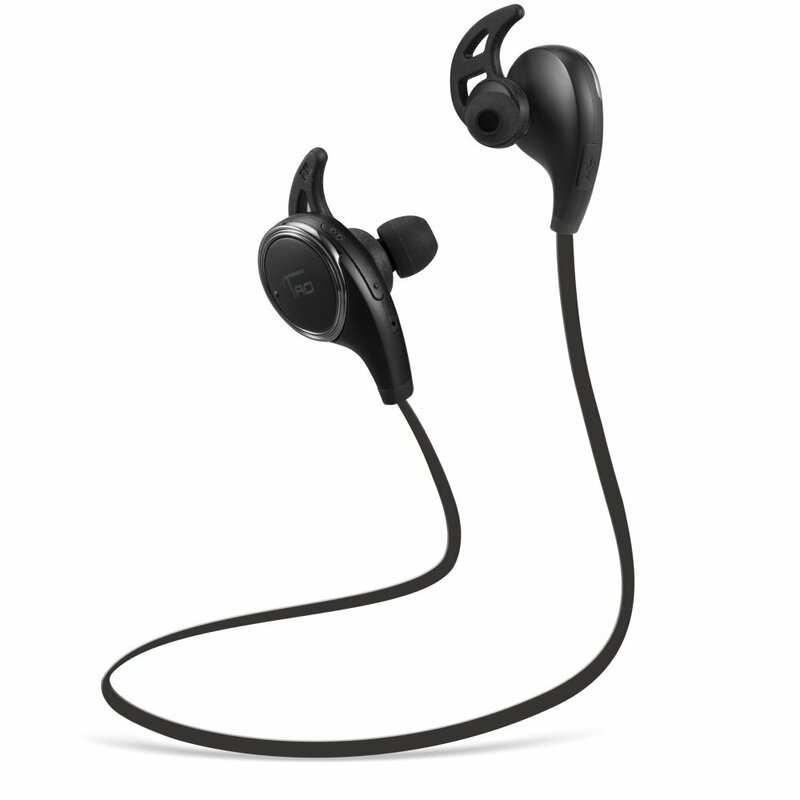 Furthermore, it also has noise cancellation technology to ensure maximum noise reduction for sports workouts and music. These headphones are ultra-lightweight and weigh less than 0.3oz, and feel comfortable and stable in your ear. The built-in rechargeable 65mAh battery provides a good 4 hours of talking and music playtime. If you are looking for a cordless and truly wireless option, the Syllable D900s is definitely one of the best Bluetooth headphones for iPhone 7 in the market now. The D900s are very easy to use and connect to your iPhone 7 via Bluetooth. The best way to connect these headphones is to power the right earbud on the first by holding the multi-function button for 2 seconds. Once the right earbud is paired, you can then power the left earbud on. This earbud will automatically connect to the right earbud. The single button on the headphones are used to power them on and off, and also for hands-free calling. The sound performance of the D900s is quite good but not spectacular, considering the size of these headphones. Once you play with these headphones and listen to the music, you will be quite satisfied and possibly blown away with the dynamic range of these headphones. We found that they have good mids, highs and decent bass which does not get muddied or tinny at maximum volume. That said, these headphones aren’t exactly super loud but can get loud enough for normal use. If you feel that the sound quality is lacking in bass, a good solution is to ensure that they seal your ears tightly, or try changing the eartips as it makes a difference with the sound quality. The bestselling point about the D900s is that they are ultra-portable headphones. In addition, these earbuds come with a special case that will charge the earbuds on the go – once they are in the case and the cover is closed the case will charge the headphones automatically. We really liked the stylish design of the casing and it has 4 LEDs to indicate the battery life it has remaining. The headphones themselves have about 4 hours of battery life and it takes about 30 minutes to charge them in the case. The case also takes about 2 hours to fully charge via Micro USB. The Verdict? The D900s are a set of good quality headphones that are truly wireless and look sleek and comfortable to wear. Although the sound performance is nothing to shout about, we found it decent and pretty good considering the size of these headphones. The D900s are one of the best Bluetooth headphones for iPhone 7 if you are looking for ultra-portable and mini sized headphones to go with your iPhone. These earbuds will also cancel out ambient noise to a certain degree, but will reproduce music at a higher quality than what you are used to from wireless earbuds. We really liked the D900s and we recommend them to go with the iPhone 7.